This Friday, 20th May, the ‘performance footprint’ network is hosting a public symposium event at the Anatomy Theatre & Museum at Kings College London. This forms part of the third and final scheduled meeting of this AHRC-funded network series — with network members also meeting the following day, Saturday 21st, to follow-up on Friday’s events and attempt to draw some conclusions. This blog entry is intended to provide some initial thoughts and context – particularly for those who are attending the public symposium but have not previously been part of the network discussions, although network members may also benefit from some insight into the thinking behind what’s planned for these two days. The purposes of this network series is, we hope, clear from its formal title – “Reflecting on Environmental Change through Site-Based Performance” (devised in response to the AHRC’s call for networks responding to the theme “Researching Environmental Change”). Each of the three meetings has taken place at a site location with distinctive, even iconic resonances – the intention being that these places would inspire focused reflection on the environmental and theatrical questions we are attempting to explore. The first meeting took place last October in North Yorkshire at Fountains Abbey & Studley Royal, the National Trust and World Heritage site, and the discussions were largely focused on consideration of the heritage site as a locus for considering environmental change. 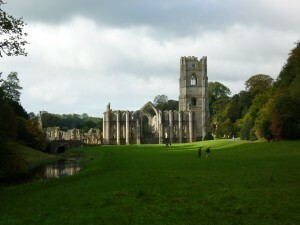 The history of human impact on this particular environment is very clear — from the monks’ re-routing of the River Skell, to move it to the side of its natural valley and around the Abbey itself, to the choices of eighteenth century landscape gardeners in (first) laying out formal water gardens along the course of the Skell, and then (responding to changing fashions) adding more informal, “picturesque” features to enhance the ostensibly natural landscape. The Fountains site is, in effect, a large-scale theatrical set that stages particular historical attitudes to human/nature relations — and much of the network’s discussions that weekend also focused on ways in which it is currently presented (staged) to the public as a major National Trust property; and also on the types of performative behaviour that it facilitates and encourages among visitors. We also considered, with invaluable input from the estate’s Head of Landscape Michael Ridsdale, the visible impacts that changing climatic conditions (unusually persistent dry weather, punctuated by sudden ‘events’ such as the 2007 floods) have had on the site’s architectural and organic infrastructure. Simply preserving the estate in something resembling its historical condition now consumes huge amounts of energy, labour and knowhow – a fact that has implications of its own. The second meeting of the network, at Cove Park artists’ retreat in Argyll and Bute (following a half-day symposium at Glasgow University) took place this February. Set amidst a surrounding nature reserve, and the imposing landscape of Scottish mountains and lochs, this meeting was billed as the one that would locate us closest to nature in its unsculpted form — at least as compared to the manufactured landscape at Fountains. To some extent, that was indeed what we experienced that weekend — with the sometimes inclement weather turning the hillside on which Cove Park is located into a rain-soaked sponge, on which even the gravel paths were literally cut apart by rivulets of water seeking fresh paths downhill. There was much consideration that weekend of non-human nature as dynamic process and agency (rather than as static “backdrop” to human activity), and many of the short, devised performance pieces created while we were there concerned themselves with trying to locate our human presence in constructive relationship with these other forces. 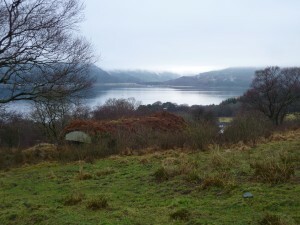 At the same time, we had to reckon with the spectre of forces of inconceivable destruction: Cove Park itself is built on the site of a World War II military compound and arms dump, and is geographically sandwiched between the present-day naval bases at Faslane and Coulport, which respectively house nuclear submarines and their warheads. There we were, right in the middle of the UK’s “independent nuclear deterrent”, looking out contemplatively through picture windows at the Scottish scenery. Over the weekend, we only scratched the surface of exploring and “performing” the contradictions inherent in that site. Which brings us, sort of, to our third and final location in the Anatomy Theatre & Museum at Kings College, London. This meeting was always conceived as the one that would place us, if you will, in “the belly of the beast” — in the middle of an entirely man-made, intensely crowded, urban environment — a far cry from either the sculpted green surroundings of Fountains or the deceptively quiet shores of Loch Long. In environmental terms London has to be conceived of not only in terms of what we see (or don’t see) locally by way of natural or architectural features, but also in terms of its role as a networked hub of global ecological impacts. Hence our invitation, early on, to the London-based collective PLATFORM to become involved in this meeting: their recent performance work and activism has been closely bound up with critiques of the financial and oil extraction industries that have major corporate headquarters within walking distance of Kings College. Alan Read, our host at Kings, proposed to create a symposium in which PLATFORM could be brought into discussion with geographer Doreen Massey, whose celebrated work on the North-South divide has more recently been complemented by research on global North-South relations (including the extraction, by the North, of human as well as material resources from other parts of the world). The symposium’s proposed consideration of the city’s global environmental impacts – particularly in terms of pollutants and toxicity (think no further than last year’s Deepwater Horizon oil spill in the Gulf of Mexico, as brought about by the oversight [in both senses of the word] of a London-based corporation, BP) – also prompted us to invite two further contributors to take part this Friday, to provide contrasting but connected perspectives. Artist and scholar David Williams will present his performance paper Plumbbomb – which is “site-based” not in relation to London but in its reflections on the contaminated nuclear test sites of Nevada. Subsequently, Illinois-based performance artist Julie Laffin will present new video work that also responds, in part, to features of the American Southwest, but which has been created specifically with Kings’ Anatomy Theatre & Museum in mind as its presentation site. Julie’s own “anatomical” situation is that severe environmental illness — which makes commonly-used, everyday chemicals effectively toxic to her — has forced her to retreat entirely from the public sphere: she can be present with us only through networked technology. By the nineteenth century, changing social attitudes and increasing scientific specialization meant that the observation of dissection became the preserve of students and specialists – but medical and anatomical museums instead emerged to take on the role of informing the curious public (as well as providing a further teaching resource). The Kings spaces date from the early part of the twentieth century, when such exhibition traditions were already fading thanks to the steady improvements in available teaching aids and medical text books — but their current use as spaces that fuse intellectual and theatrical enquiry is perhaps not that inconsistent with their former purpose. – the vital presence of water: the River Skell and its water gardens, too prone to flooding; Loch Long and its many tributaries on the sodden hillside at Cove Park; the River Thames, which used to have a shore on what is now The Strand (which means ‘beach’), until the construction of the Victoria Embankment. London’s own tributary rivers, flowing into the Thames, are today largely culverted under its roads and buildings, and surface to public view only when they flood… The threat of such groundwater flooding will be addressed by our special guest on Saturday 21st, Michael Guthrie (Environment Agency). – the notion of “retreat” — be it the artists’ retreat at Cove Park, the monastic removal from “the world” at Fountains Abbey, or indeed Studley Royal’s landscape garden design (complete with faux hermitage) which engineered a tranquil escape from the urban and everyday. Kings College and its environs may not look much like a retreat, but the Anatomy Theatre & Museum are squirrelled away deep within the buildings of the Strand campus, and they represent a history in which the acquisition of knowledge was/is regarded as a specialised vocation, set aside from the everyday world. Some see the separation and isolation of knowledge into so many different fields as contributing to our current problems in thinking through global threats – we “can’t see the wood for the trees”. But is there also, in the notion of “retreat”, a commitment to gaining clearer insight through a process of stepping back? I hope my various musings here have provided some context and introduction for our meetings at Kings. I look forward to seeing you there! This entry was posted in Kings College. Bookmark the permalink.